Hi folks this is Gary Solomon the Host of the Laidback Bike Report . We try to bring you the best recumbent related webcast every month and occasional special reports from on location. We are so excited to have just brought Larry Varney on the show he of the long white beard and the impeccable bent credentials. 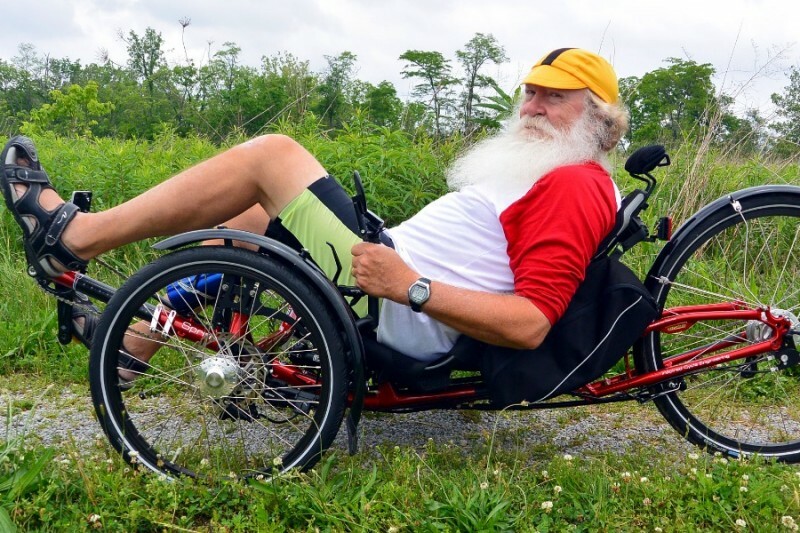 I am taking the show on the road to Germany next month to the grandaddy of recumbent exhibitions known as Spezi . We plan on creating another special video report similar to our Recumbent Cycle-Con show from last September. But I won't have a group of volunteers helping me this time. Just my wife and myself to interview, run the camcorder, monitor the audio and keep people from walking right in front of the camera while shooting (it happens all the time). But as luck would have it I have received an offer to help out both behind and in front of the camera from none other than Larry Varney. But as luck would also have it he doesn't have the money to fund the trip and I certainly don't have any income from the show to cover his expenses. So here's the plan. If we can raise about $3000 before the end of March I'll use the money to pay for Larry's plane tickets, hotels, and food for 4 days to cover his expenses while at Spezi. If we can raise $4000 Larry will stay on for the next week and accompany us on our Trike Trip on the Rhine Tour. We will then create another separate video documenting our travels via trike featuring Larry's evaluation of trike he is riding and any other bent riders or shops we encounter along the way. The dollar total amounts above are actually estimates as I can't know for sure what all the costs will be. I will tally up all the invoices and receipts after we return and take that amount from the gofundme money. What happens if we don't make our goal? We have decided to use all the money as a donation to Project Mobility. Any funds we collect that are over and above our expenses will also be donated to Project Mobility. Larry and I sure appreciate any help you can give us and promise to deliver the best online video coverage of our trip we can possibly offer. Do it up proud Larry. I would like to meet you at SPEZI 2016. Hope you make it Larry. Sounds like fun. Larry must have healthy German food only. American style fast food forbidden! Good ideas have to be supported! See you in Germersheim!